I am actually sharing something from another blog - Taste for Adventure by Tablespoon - and can only encourage you to check this blog out. The recipes are great and the photos so beautiful they make your mouth water. I am an avid fan of coleslaw in many forms and probably now have about ten recipes I rotate between. I have no idea why I crave coleslaw, but I can make a lunch out of it any day of the week and often include it as a part of a menu where I need to prep most of the meal ahead of time. While I still love a more traditional greens combination, if you're going to have salad a part of your daily diet, variety is the key. This recipe was posted by the above blogger on Facebook and it immediately caught my attention because it was so bright and colourful. Coleslaw can end up a combination of pale greens in general, but the use of Red Cabbage took it to a whole new place in the colour spectrum. Add in carrots, snap peas and 2 colours of pepper and voila! 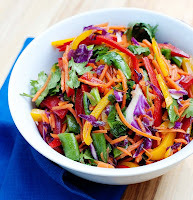 The ofiginal salad dressing with a whole tablespoon of cumin is different and if you look at the comments, most people prefer to cut back on this spice. It does have a very strong, distinctive flavour that people either love or don't, so be cautious and add this ingredient in small increments. You could easily use a dressing you prefer on this. I offer it with a Honey Mustard Vinaigrette, but show the original dressing at the bottom. To me the biggest appeal is the beautiful colour and crisp texture. Just whisk the ingredients together and set aside. Drizzle over the salad just before serving and toss to coat. This recipe makes more than you will need for the slaw, so you will have some to enjoy another day. NOTE - I no longer use the recipe above, and now make an impromptu dressing without much measuring. I bought a bottle of Peach White Balsamic Vinegar and Basil Olive Oil at a specialty shop and inserted special pour spouts in them. I do a several swirls around the bowl of each - approximately equal amounts, add about a Tablespoon of Honey Dijon Mustard and a Tablespoon of honey. After a good toss I taste it and add more vinegar and olive oil if needed. Simple, easy and delicious. Hats off to a Taste for Adventure by Tablespoon for this wonderful offering. I have to admit I wasn't big on the Cumin dressing, so switched to one that I love. I can't wait to try more on her blog site. I have several other posting on Olio by Marilyn that offer more coleslaw recipes, so feel free to wander through my Let's Talk Food folder. Mix honey, lime juice, vinegar, cumin, salt and pepper in a small bowl. Whisk in olive oil and set aside. Add all salad mix ingredients to large bowl and toss. If making this ahead of time you can set both of these aside for a couple hours. Shortly before serving toss the salad mix with the dressing. The amount you use is up to your taste as some like a lot of dressing, some like just a light taste. Time to break out all those great cool summer salads while the season is upon us! Fall is coming soon enough.